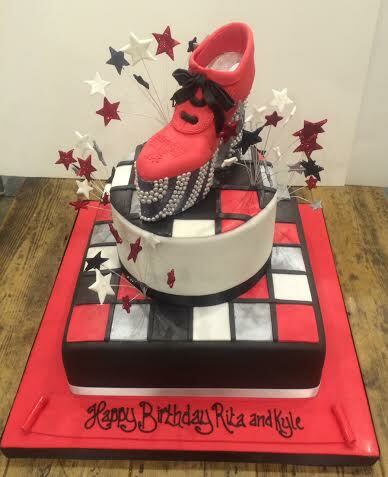 To celebrate the launch of Rita Ora’s new album (I Will Never Let You Down), I thought it was a good time to share the birthday cake we made for her and her friend Kyle’s joint birthday a few months ago at The Box. We were given 6 hours notice to make the cake so we were rather chuffed with the outcome. The theme of the party was 70s disco so we made a sugar platform shoe on a disco floor with jumping stars. She loved it!